Marche (or Le Marche) is a central Italian region of two halves. To the west there’s mountains, hills and fertile soil, which makes the area famous for its vegetables, pules and legumes. To the east is the Adriatic Sea, with little seaside villages cooking up the day’s catch. On top of all this, the people of Marche are enthusiastic meat eaters, with many a family get-together focused on a huge feast of fried or grilled beef, lamb, chicken and pork. This collection of Marche recipes is the perfect way to get to grips with the region’s most famous dishes. Fritto misto is certainly one of the most popular meals amongst the locals, and you can create your own platter of fried deliciousness by preparing Olive ascolane, Verdure fritto and Crema fritta. 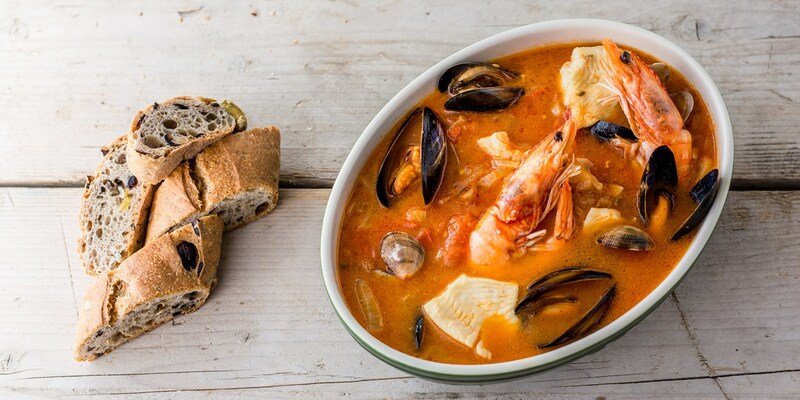 If you prefer the sound of Marche’s coastal cuisine, however, then the ultimate dish has to be Brodetto, a regional soup that can change from town to town but always includes a variety of fish and seafood in a simple broth. Vincisgrassi is the pasta dish lasagne wishes it could be – a rich sauce of chicken livers, pork, beef and sweetbreads layered with béchamel sauce and pasta – but if you want something a little lighter then the Minestra di ceci should tick all the boxes. Marche might not be as well known as its neighbours Lazio or Tuscany, but recipes like the ones listed below prove it’s a bit of an undiscovered culinary paradise. Besides, anywhere that dishes up platters of deep-fried set cream (often as a starter, no less) are definitely worth a visit.